Price above is quoted for 2pax size and will decrease if group size is from 3pax. 08h00 – 08h30: Pick-up at hotel and start the scenic, 3 and ½ hour drive to Halong Bay. 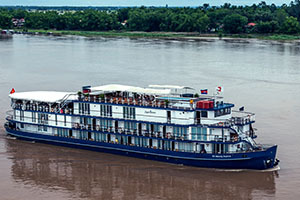 12h30 – 13h00: Embark on V’Spirit Classic Cruise followed by a short cruise briefing. 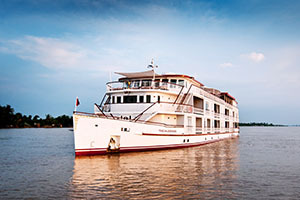 13h30 – 14h30: Savor a delectable lunch as V’Spirit Classic cruises among the limestone islands. 15h00 – 16h00: Explore the amazing Sung Sot Cave – the most beautiful cave in Halong Bay. 16h00 – 17h00: Cruising to Titov island. Go swimming and relaxing at the beach of Titov or climb up to the top of the island for a panorama view of Halong Bay. 17h00 – 17h30: Return to the main boat and continue cruising to the quiet area while enjoy beautiful seascape on the way. 17h30 – 19h00: Enjoy Sunset Party on sundeck and admire the best moments of the day when the sun starts to set. 19h00: Dinner is served. Socialize with other guests, take part in board games, fish for squid, or just laze around. 06h30 – 07h00: Start your day with Tai Chi exercises or a photo hunt. 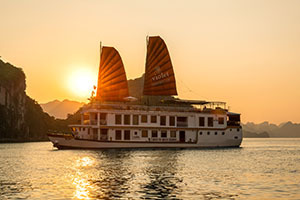 07h30 – 08h30: Have breakfast on board and enjoy the peaceful morning of Halong Bay. 08h30 – 09h00: Transfer to V’Spirit day boat. 12h00 – 14h00: Return to the day boat. Relax and enjoy lunch on board. 14h30 – 16h00: Visit a Pearl Farm and learn the technique for making high quality pearls. 16h00 – 17h00: Back to the main boat. Freshen up. 17h00 – 19h00: Enjoy the beautiful sunset on the sundeck. 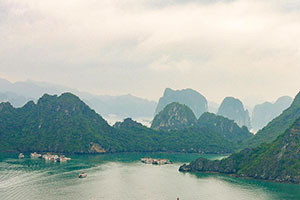 07h00 – 07h30: Have breakfast on board and enjoy the peaceful morning of Halong Bay. 08h30 – 09h30: Kayak around the Drum Cave. 09h45: Return to the boat. Freshen up and check out of your cabin. 10h00 – 10h30: Continue your cruise exploring the Bay, passing Ba Hang fishing village, Dog Islet, and more. 10h30 – 11h30: While heading back to the harbor, watch the fruit carving demonstration and participate in the Cooking Class before enjoying a traditional Vietnamese lunch. 11h45 – 12h00: Disembark V’Spirit Classic. 12h15 – 12h30 : Transfer back to Hanoi. • Advanced reservation is required with full passenger details, including Full Name, Date of Birth, Nationality, Passport Number, Visa Expiry Date etc. • A valid passport is required upon check-in on board. • Charter service is available upon request. • Special requests on food (diet or vegetarian) please inform us before departure.